You have the satisfaction of knowing the AquaShield is the safest, most effective cast and bandage protector available in the world. It has been used daily by hundreds of thousands of patients for bathing, showering and swimming for as long as four years without a tear or leak. 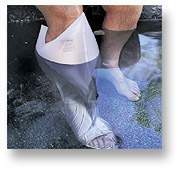 The AquaShield has been manufactured by Orthomed Products, Inc. in California since 1988. In the United States, AquaShield distributors are generally calling on orthopedic and podiatric offices and related hospital departments. In addition: hand surgery, lymphedema, burns, diabetic and ulcerated wounds, prosthesis, IV sites, and PICC lines are good opportunities for the AquaShield. Elsewhere in the world, it appears pharmacies, private clinics and hospitals are the primary market for the AquaShield. The AquaShield comes in an attractive retail display box or a space-saving ziploc bag. Each include complete how-to-use instructions in English. If you are interested in distributing the AquaShield and wish to receive a sample and literature more fully describing the AquaShield and its competitive advantages, please complete the following form and e-mail to us.